Certain portions and functions of The Villages MINI Cooper Club website are restricted to registered Users. 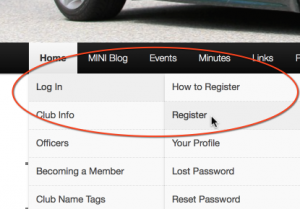 To register as a User of the website you must be a current active paid member of The Villages MINI Cooper Club. You must complete and submit a Membership Application Form (Click THIS LINK for a copy of the form) and pay dues. Once your Application has been accepted, you can register as a website “User” by following the steps below. Your website registration may take up to 24 hours for approval. Each registered User must have a unique e-mail address. We welcome and encourage each member of your MINI household to register as individual Users. HOWEVER, If your family shares a single email account, only one User can register for the site. For a demo video on how to register for the site click THIS LINK to view a YouTube demo.